Finally, it is here – A Solar powered Mobile phone – It is surprising that Mobile sector has seen a lot of innovation, but not much has happened when it came to powering / charging mobile through this abundantly available source of Energy. 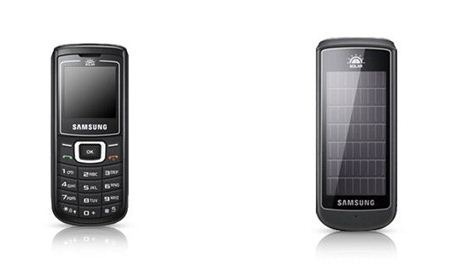 Samsung has now announced launch of its first solar chargeable phone – Samsung E1107, which allows charging of Mobile battery through Solar power. The newly launched phone can give you between 5 to 10 minutes of talk time on 1 hr of solar charge. Samsung claims that the battery can attain full power with about 40 hours of solar charging. This can be a boon especially in rural areas where there is no access to electricity or even when you are outdoors and your battery is drained. You will have to just keep you phone in Sun-light, and you are ready to go ! Offcourse, there are challenges, like time-taken to charge due to limited sized solar panel or the phone heat when kept in sun-light for charging etc. etc. But its utility far exceeds these challenges. This is a pretty basic phone, having usual features along with FM Radio, Torch light and enhanced security. I think the best part about this phone is its pricing – It is expected to price around INR 2800 and will be very appealing to rural Indian Mobile users. What is your take on this Solar powered phone ? Do you expect to see market flood with similar solar mobiles phones from other manufacturers as well ? 100 times faster Internet – New Network design in works! Vodafone Launches Lowest-Cost mobile phone, beats Nokia to it ! Mobile industry keeps on changing time to time…starting from basic phones, then phones with radio,then camera phones,then music phones and so on.now is the time of touch phones.Samsung seems to be innovating in this arena and creeping up its market share.This solar powered phone is again an innovation which could change the mindset of its competitors.Their is good opportunity in the Indian market for such phones.Rural market should accept it with open arms.Even lower income group market should also accept this phone.And if the target market is LIG,then cab drivers,auto drivers and field job employees should use this phone.But with this target market,it would be difficult for this phone to attract other target market until or unless this basic phone is integrated with additional features(just to attract the upper market or youth).Till then we just need to see the acceptance of this phone in the market.But overall,with rising global environmental concerns,people should accept this phone. Tech-Vidhya is the leading provider of IT trainings with extra focus on Certifications. An ever-increasing demand for trained computer software professionals. To cater to these training needs, Tech-Vidhya provides a range of training programs for C and C++ programming, Core Java, Advanced Java, Visual Basic, Oracle, SQL, Dream Viewer, Php, Ruby, .net, joomla, Advanced J2EE as also an extensive Advanced Diploma in Software Engineering (ADSE). We also excel in training for vendor-based certifications such as MCAD, MCSD, CCNA, ADOBE, SUN & MCDBA etc. The training offered makes and individual perfect and complete engineers which assists the companies to get best out of them for better developments. Hopefully we`ll see even more similar solar cell phones like this one. Ohh awesome phone.. This was much needed. Most of the people in villages cannot buy a phone above 5k and i am sure this phone will be in the same price range. Also they should really do more RnD and try to increase the battery life. Because 1hour of sunlight for 5 to 10mins talk time is not good. This wont help in case of emergency..
Technology is, indeed, moving at a faster pace (in fact, its more about getting away from use of technology when we speak about tapping renewable energy). Coming specifically to this solar chargeable mobile handset, I feel 5-10 min of talktime on solar charging of a handset is still a ridiculously low productiviity output. In fact, I’d say the technology is here, but it needs to be upgraded and refined in order to provide enhanced output. Altaf has suggested the idea of cable-tied solar chargers, but in my view it would be a bit too cumbersome and inconvenient, especially in this era when most of the locations have criss-crossing TV cable & broadband wires all over the place. Rather people would prefer the usual electrical chargers for indoor purposes. Most of the time people are spending time in offices (very few have either balconies or windows) so while in office charging is not possible. Bythe time go back home, its already dark. So solar power will not be sufficient for mobiles. May be its only a biginning. Later they will come with high efficiency chargers which will charge 20 minutes talk time per hr of charging. Or a seperate gadget with solar panels with long cable will be good idea. We can hang the solar panel outside the window (far away from office work station) and pull the cable to charge the mobile. This way we can have a bigger solar panel with quick charge. yes, d idea u ve suggested is a nyc 1… may b it wuld ve worked if u wer a employee in samsung co.,.